For women, pregnancy and high blood pressure can go hand in hand. Although high blood pressure during pregnancy isn’t always a problem, it can sometimes cause serious complications for both baby and mother. High blood pressure—also called hypertension—happens when the pressure on the blood vessels and arteries becomes too great. The arterial wall also becomes distorted, and this leads to added stress on the heart. In general, hypertension is classified by systolic and diastolic numbers higher than 140 millimeters of mercury (mmHg) and 90 mmHg, respectively. Hypertension may have been present before pregnancy or after pregnancy—a condition known as gestational hypertension. Either way, this can lead to premature birth or low birth weight. Therefore, it is important to manage blood pressure during pregnancy. In this article, we will examine the various blood pressure issues that may arise during pregnancy, as well as the causes, complications, symptoms, and types of high blood pressure during pregnancy. How might a blood pressure reading change during pregnancy? We will explain this and also discuss how to treat and prevent high blood pressure during pregnancy. What is a normal blood pressure range during pregnancy? To determine normal blood pressure during pregnancy, your doctor will take a baseline blood pressure measurement during your initial visit. Blood pressure is then measured during each subsequent visit. Normal blood pressure will often vary, with systolic blood pressure ranging between 120 and 129 mmHg and diastolic blood pressure ranging between 80 and 85 mmHg. What is considered high blood pressure for a pregnant woman? High blood pressure in pregnancy is often a systolic blood pressure of 140 mmHg and over, and a diastolic blood pressure of 90 mmHg and over. High blood pressure during pregnancy is also classified as any systolic blood pressure reading 15 points higher than your baseline. What about when your blood pressure drops too low? In early pregnancy, often from five weeks pregnant to the middle of the second trimester, your blood pressure may fall. This is due to pregnancy hormones stimulating blood vessels to widen, and blood flow resistance therefore isn’t as high. Symptoms of low blood pressure will include feeling faint; dizziness; headaches; nausea; and cold, clammy skin. There are several potential causes of high blood pressure during pregnancy. For instance, unhealthy lifestyle choices may lead to hypertension while pregnant. Being overweight, obese, inactive, a regular drinker, or a smoker is thought to increase your risk. If it is your first pregnancy, you are also more likely to experience hypertension. However, there is a lower chance of high blood pressure if you have multiple pregnancies with the same partner. You can also be at risk if you are pregnant and over age 40, as well as when you’re carrying more than one child at the same time. Using assisted reproductive technology, like in vitro fertilization, can also increase your risk of high blood pressure during pregnancy. Women who had hypertension before pregnancy are also at risk for high blood pressure complications during pregnancy. Gestational hypertension causes high blood pressure after 20 weeks of pregnancy. This condition often resolves after delivery, and induced labor is the most common complication. It also may increase the risk of gestational hypertension in the future. There is a high chance it will progress to preeclampsia when diagnosed before 30 weeks. When a woman has hypertension before getting pregnant, this can be called chronic hypertension. If high blood pressure develops during the first 20 weeks of pregnancy, it is also called chronic hypertension. At the same time, hypertension often doesn’t have symptoms; therefore, it may be hard to determine when high blood pressure began. This type of high blood pressure occurs when hypertension develops after 20 weeks of pregnancy, and it is also associated with signs of damage to organ systems including the brain, blood, liver, or kidneys. When it occurs before 32 weeks of pregnancy, it is known as early-onset preeclampsia. It can also occur postpartum. Untreated preeclampsia is serious and can even be fatal for the mother and baby. It can also lead to seizures—also called eclampsia. At one point, preeclampsia was diagnosed only when a pregnant woman had hypertension along with abnormal protein levels in the urine (proteinuria). However, it is possible to have preeclampsia without protein in the urine. Preeclampsia is also common in those with thrombophilia, diabetes, or lupus. This is another type of chronic hypertension where a woman has high blood pressure before becoming pregnant. She will also experience protein in the urine and other complications during the progression of the pregnancy. What are the symptoms and signs of high blood pressure during pregnancy? First, it is important to remember to monitor your blood pressure. This is an important part of prenatal care. Classic high blood pressure denotes a reading of 140 mmHg over 90 mmHg and above, while prehypertension is considered 130 mmHg to 139 mmHg over 80 mmHg to 89 mmHg. After 20 weeks of pregnancy, if your blood pressure is above 140 mmHg over 90 mmHg on two or more occasions, a minimum of four hours apart, and without any other organ damage, you will receive a diagnosis of gestational hypertension. Other than a high blood pressure reading, other signs of high blood pressure during pregnancy include severe headaches; excess protein in the urine or additional signs of kidney problems; excessive nausea or vomiting or vomiting blood; impaired liver function; shortness of breath due to fluid in the lungs; reduced levels of platelets in the blood; upper abdominal pain often under the ribs on the right side; and vision changes like light sensitivity, blurry vision, or temporary vision loss. Other symptoms include a rapid heartbeat, blood in the urine, ringing in the ears, flushed cheeks, unexplained sweating, dizziness, and nosebleeds. Swelling (water retention) and sudden weight gain, often in the hands and face, are also common with preeclampsia. That being said, weight gain and swelling are not reliable preeclampsia signs without other accompanying symptoms since they also occur in a normal pregnancy. 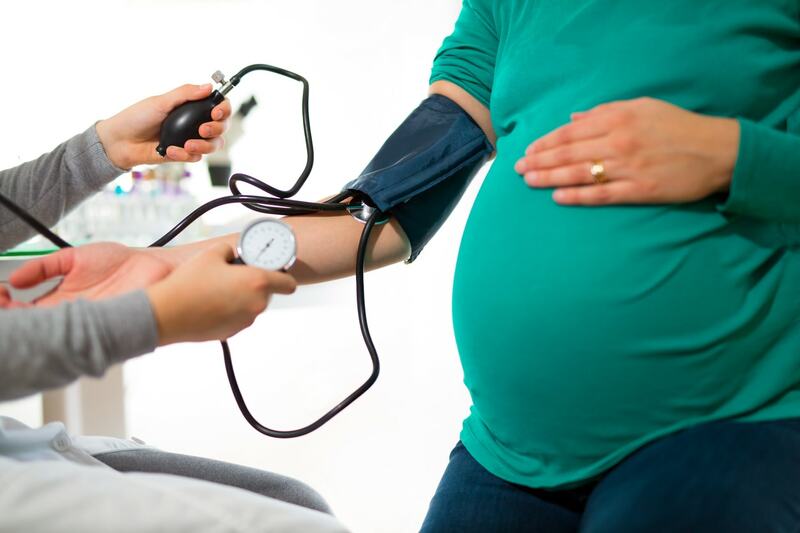 What complications can occur when there is high blood pressure during pregnancy? There is a higher risk of breathing problems before or during labor, or the baby may experience impaired growth. Women with high blood pressure disorders during pregnancy also have an increased risk of hypertension after delivery. Placental abruption: Preeclampsia can lead to placental abruption, where the placenta separates from the inner wall of the uterus before delivery. Severe abruption can lead to heavy bleeding, which is potentially life-threatening to both mother and baby. Reduced blood flow to the placenta: When the placenta doesn’t get enough blood, the baby may receive fewer nutrients and less oxygen. This can result in low birth weight, premature or preterm birth, and slow growth, or intrauterine growth restriction. Injury to other organs: Poorly controlled high blood pressure can lead to injuries to the heart, lungs, brain, liver, kidneys, and other major organs. This can be life-threatening in severe cases. Premature delivery: An early delivery is sometimes necessary to prevent life-threatening complications when hypertension is present during pregnancy. Future cardiovascular disease: Preeclampsia may increase the risk of cardiovascular disease, including stroke, heart attack, or hypertension. The risk of cardiovascular disease is higher when the mother has had a premature birth due to high blood pressure during pregnancy or had preeclampsia more than once. Miscarriage: Research from the American Heart Association’s journal Hypertension in 2018 has found that high blood pressure before pregnancy may increase the risk of miscarriage—also called pregnancy loss. Childhood obesity: A study published in the Endocrine Society’s Journal of Clinical Endocrinology & Metabolism in 2017 found that high blood pressure during pregnancy may increase the risk of the baby developing childhood obesity. HELLP syndrome is another complication of high blood pressure during pregnancy. This develops when a pregnant woman with eclampsia or preeclampsia suffers damage to blood cells and the liver. HELLP stands for Hemolysis, Elevated Liver enzymes, and Low Platelet count. Symptoms will include upper abdominal pain, headache, vomiting, and nausea. It is considered a medical emergency since it can severely damage organ systems. Sometimes a premature delivery is needed, which can lead to low birth weight and delays in the baby’s growth. Left ventricle becomes thicker and larger: The left ventricle is the left side of the heart, which is responsible for significant pumping. When the left ventricle temporarily becomes larger and thicker, it allows the heart to work harder when there is increased blood volume. Blood levels in a woman’s body increase: Research published in the journal Circulation in 2014 shows that a woman’s blood volume will increase by as much as 45% when pregnant. The heart must pump the extra blood throughout the body, and this leads to the higher blood pressure reading. Kidneys release hormone: The kidneys release increased amounts of a hormone called vasopressin, which leads to greater water retention and increased blood pressure and arterial pressure. After-birth BP: High blood pressure often immediately returns to normal after the baby is delivered. However, when high blood pressure remains, your doctor may offer treatment. It is important to manage high blood pressure during pregnancy. Taking care of your body is the best way to benefit your developing baby. Keep prenatal appointments: Be sure to visit your health care practitioner on a regular basis throughout your pregnancy. This will help you keep track of your blood pressure levels during each appointment. You can also purchase a blood pressure monitor, and pharmacies and grocery stores often carry machines that take blood pressure readings. Treat high blood pressure: Your doctor may prescribe antihypertensive drugs, such as beta blockers, ACE (angiotensin-converting enzyme) inhibitors, ARBs (angiotensin II receptor blockers), direct renin inhibitors, diuretics, and calcium channel blockers. At the same time, you can use some of the natural blood pressure-lowering methods mentioned in the next section. Stay active and reduce stress: Aim to get at least 20 to 30 minutes of physical activity daily. Try to go for a walk and spend time in nature. Stress reduction is also a great way to lower blood pressure, and prenatal yoga classes, meditation, and deep breathing are excellent natural stress relievers. Eat a healthy diet: The Mediterranean and DASH (Dietary Approaches to Stop Hypertension) diets are considered two of the best diets to manage blood pressure. Both are high in fiber, potassium, and omega-3 fatty acids, and lower in salt. Include items such as coconut water, avocados, flaxseeds, chia seeds, and wild-caught salmon. How can you lower your blood pressure while pregnant without the need for drugs? This section will detail high BP during pregnancy natural remedies. As a general rule, when pregnant or breastfeeding, mention any supplement you take to your doctor just to make sure it is the right fit for you. Inflammation in the arteries is a cause of high blood pressure, and multiple studies show that fish oil can reduce high blood pressure. It is best to take 1,000 milligrams (mg) of high-quality fish oil daily with meals. Coenzyme Q10, or CoQ10, is a critical antioxidant for heart health support, and is crucial if you’ve ever taken antihypertensive or cholesterol-lowering drugs. The general dosage will be 200 mg to 300 mg per day. Potassium supplements are not considered as effective as potassium-rich foods. As a result, avoid high doses of potassium supplements. Foods high in potassium include sweet potato, acorn squash, spinach, bananas, celery, romaine lettuce, and broccoli. Magnesium is able to relax your blood vessels, and therefore naturally lowers blood pressure. Interestingly, many people with high blood pressure also have a magnesium deficiency. Take 500 mg of magnesium daily in supplement form. In addition, good food sources include beets, collard greens, cucumbers, kefir, figs, black beans, almonds, and pumpkin seeds. Quercetin is a flavonoid antioxidant that can manage heart and blood vessel problems such as high blood pressure. Those who eat a quercetin-rich diet are less likely to experience hypertension. Quercetin is found naturally in berries, tomatoes, olive oil, capers, and leafy greens. For quercetin supplements, 500 mg can be taken twice daily; however, you can get benefits from lower doses as well. A number of vitamins are very important for pregnant women. B vitamins such as folate and B12 are not only great for pregnancy, but they also are excellent for heart health and controlling high blood pressure. Other vitamins used to lower blood pressure include vitamin C, vitamin D, and vitamin K.
Many herbal remedies can help lower blood pressure. Herbs and plant remedies known to have blood-pressure lowering effects include reishi mushrooms, Siberian ginseng, Gynostemma pentaphyllum, motherwort, hawthorn, grape seed extract, snakeroot, Ginkgo biloba, valerian, passionflower, and hibiscus tea. Essential oils may also lower blood pressure by dilating arteries, acting as antioxidant agents to reduce oxidative stress and emotional stress. The best antihypertensive essential oils include sweet marjoram, lavender, neroli, ylang ylang, frankincense, and clary sage. It is best to diffuse these oils with a diffuser, or combine a few drops of one of the oils with a carrier oil like coconut oil or jojoba oil and rub onto your body. A homeopath can advise you on the best homeopathic remedies that help lower blood pressure when you are pregnant. Some of the most common homeopathic remedies for high blood pressure include Nux vomica, Natrum muriaticum, lachesis, glonoinum, belladonna, Argentum nitricum, Viscum album, and sulphur. How do you prevent high pressure from affecting your pregnancy? This section includes tips for how to prevent high blood pressure during pregnancy. We will focus mostly on what to avoid while pregnant. Quit smoking: Smoking causes major damage to your blood vessels, and this raises your risk for heart problems like high blood pressure. It will also worsen blood pressure complications and make it harder to reverse hypertension. Techniques to help you quit smoking include cognitive behavioral therapy, hypnosis, tai chi, and acupuncture. Avoid alcohol: Alcohol is well known to wreak havoc on the heart. It narrows the arteries and increases your risk of high blood pressure. Alcohol is always off-limits during pregnancy. Eliminate simple sugars: High consumption of simple sugars has repeatedly been found to increase the risk of hypertension and other heart problems. Avoid simple carbohydrates such as glucose, fructose, and sucrose, which are found in processed foods, candies, baked goods, dairy products, and refined grains. Reduce caffeine intake: Overindulgence in caffeine is a major cause of high blood pressure. Reduce your consumption of coffee and other beverages high in caffeine, such as caffeinated teas and sodas. The presence of sugar in caffeinated beverages can also be a problem for your blood pressure. High blood pressure during pregnancy is often not serious. That being said, if hypertension goes untreated, it may be life-threatening for both mother and baby. Hypertensive disorders due to high blood pressure are the second-leading cause of maternal death during pregnancy in the U.S.
That is why it is important to understand the symptoms, causes, risk factors, complications, and types of high blood pressure that you may experience during pregnancy. For the healthiest pregnancy outcome possible, always stay on top of your prenatal care. When you have high blood pressure during pregnancy, manage it with exercise, a healthy diet, and treatments such as vitamins, minerals, herbal remedies, essential oils, and other supplements. Also, be sure to monitor your blood pressure on a regular basis, whether at home or at the doctor’s office, pharmacies, or grocery stores. “High Blood Pressure During Pregnancy,” PregMed, February 1, 2014; https://www.pregmed.org/high-blood-pressure-during-pregnancy.htm, last accessed July 12, 2018. “Preeclampsia and High Blood Pressure During Pregnancy,” The American College of Obstetricians and Gynecologists; https://www.acog.org/~/media/For%20Patients/faq034.pdf, last accessed July 12, 2018. “What is blood pressure?” Family Doctor; https://familydoctor.org/condition/pregnancy-induced-hypertension/?adfree=true, last accessed July 12, 2018. “High blood pressure before pregnancy may increase miscarriage risk,” American Heart Association, April 2, 2018; https://newsroom.heart.org/news/higher-blood-pressure-before-pregnancy-may-increase-miscarriage-risk?preview=270c, last accessed July 12, 2018. Sanghavi, M., et al., “Cardiovascular Physiology of Pregnancy,” Circulation, Sept. 2014; 130: 1003-1008, doi: 10.1161/CIRCULATIONAHA.114.009029.